Where ever you are the solargorilla gives you power anywhere where there is sun. 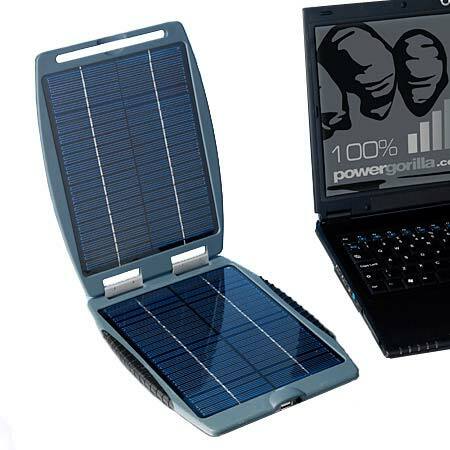 The Solargorilla's 24 volt and 5 volt USB socket make it the ultimate portable solar power station for your laptop, mobile phone, iPod and many more portable electronic devices. The Solargorilla has two PV (photovoltaic) solar panels, which generate electric current when they are under sunlight. The green LED on the Solargorilla indicates the strength of charge - the more sunlight - the more charge you will get! The advanced solar panels ensure superb power and reliable performance, all contained within a tough outer casing. Solargorilla is compatible with most laptops, mobile phones, iPods, Sat Navs, PDAs, iPhones, PSP and other handheld games consoles. You can even use the Solargorilla to recharge the Powergorilla which is a battery pack that will store the charge for later use - simply attach it using the 2m extension cable and the L52D tip. A total portable power station!